How to improve your sales using Linkedin. Linkedin is not new. In fact, more than 10 years ago I was using to help me grow my business. The new era of sales requires you to use the tools in ways that allow you to connect and engage before you try to sale. I talk to Phil Gerbyshak today to get new insights on using LinkedIn for sale. Discover the art of more sales using Linkedin in today’s interview. Target Audience: Phil Gerbyshak is a sales & marketing technology speaker & Trainer. Phil works with small businesses and sales professionals to get more leads, set more qualified appointments, earn quality referrals and close more business, using LinkedIn, video, content marketing, and the telephone. Currently, Phil does programs, trains, and coaches people how to build their business by maximizing their use of technology and social media in their day to day jobs. Gene Hammett: Hi, I’m Gene Hammett. 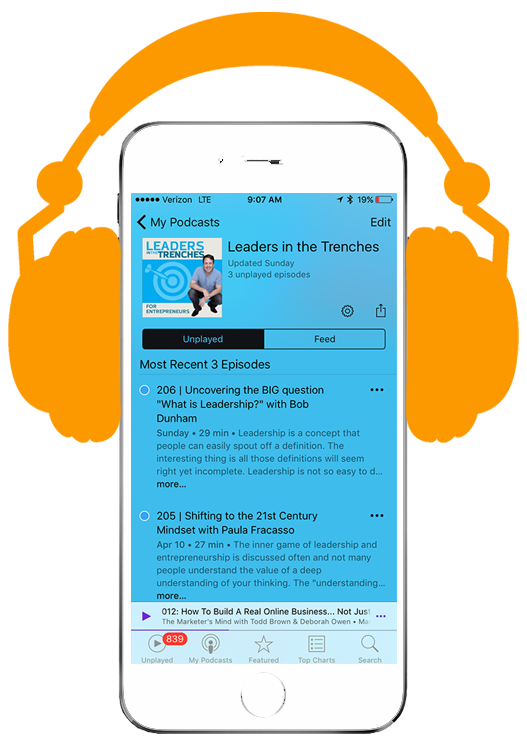 I’m the host of leaders in the trenches, and my question for you today is what are you using specifically to attract B2B clients? Well, if you’re not using linkedin, you’re probably missing the opportunity to connect with people who are doing work inside of this, and this is not your normal linkedin conversation because those are a dime a dozen. 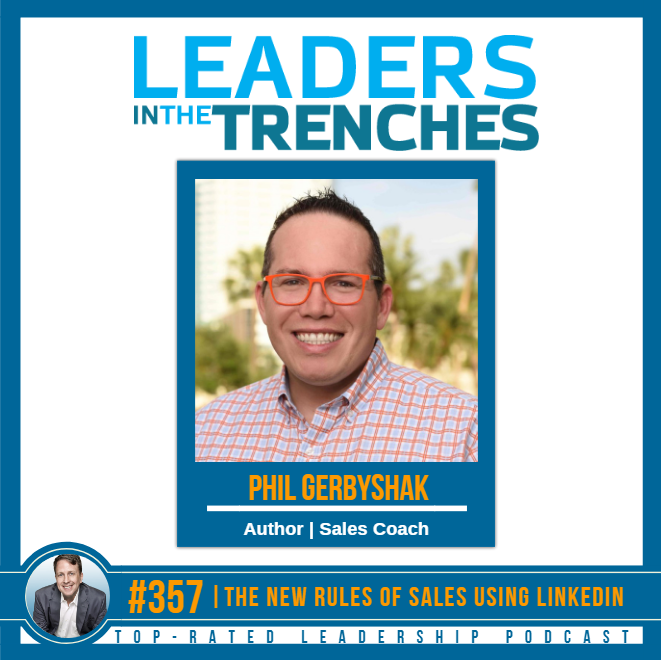 I went straight to Phil Gerbyshak to talk about what are the strategies that are working today and I was surprised I. I’ve been using Linkedin for years and he really blew me away with some of the mistakes that are being made. Some of the things that you could do to take your profile to the next level of some of the things you can do to take your sales strategies, the next level and specifically one missing little component there that really helped you. I’m not going to tell you what it is because you have to listen to the interview with Phil Gerbyshak to tell what exactly what it is. All right, so here’s the interview with Phil. Gene Hammett: Phil, when you are looking at, um, when working with people on Linkedin, strategies, why are linkedin, so important right now in the marketplace. Phil Gerbyshak: Well, a lot of people don’t realize this, but Microsoft owns linkedin. They didn’t rebrand it. It still says linkedin. So a lot of people that happen to almost two years ago now and people are gathered. Okay, big deal. Well, Microsoft is a frequent behemoth. I mean all the Microsoft Office, which is now office three 65 online requires a Microsoft login, which means maybe not today, maybe not tomorrow, but very soon. That’s going to mean a linkedin login. So we’re going to go from about 550 600 million users, 150 to $175 million in the United States and I expect that’s going to double or tend to act even in the next three years because who doesn’t use a Microsoft product now? Some people, sure they use google. That’s great, but I still need my powerpoint. Phil Gerbyshak: Will it get powerpoint? I still need a Microsoft office subscription, which means eventually I’m going to be on linkedin. That’s the first reason. The second reason is that go google somewhat. Heck, Google me. Google Phil Gerbyshak. The second or third thing that comes up is linkedin will. Of course my website comes up first, but that’s me bragging about me. Linkedin is a trusted third party that I can add recommendations to, uh, people that worked with me. And when I say I can add them, I don’t mean that I can type them up and say, Hey, Gene says I’m really freaking awesome. No, no. These are unsolicited on the edited, unvarnished truths about how it is to work with me. Now, sure, if someone says that I’m a Schmuck, I’m not going to put that on my profile, but any compliment that is a recommendation is from a real person. Phil Gerbyshak: So now instead of just some couple lines, testimonial, now you can click and you can see is that a real person? Is that person like me? That’s social proof is incredible. So that’s the second reason. The third reason that linkedin is so important. So Microsoft owns them? Yep. Got It. Social proof. It’s the second or third hit and Google. Yep. Got It. The third reason is because once you first degree connect, once you and I agree that we’re connections in Linkedin, you can now export those into an excel file and now I can email them all individually. Notice I didn’t say you can add them to your mailing list, that would make you a saint, but you can email them individually so I can take that networking, that connection, that person I’ve been pouring value into. Instead of adding volume at, now I can deepen that relationship. Phil Gerbyshak: I said, Hey Gene, what’s going on man? Let’s have a conversation and maybe maybe their phone numbers on there too. So just today, someone that I didn’t have their phone number, I went to his linkedin profile because we’re first degree connections and ringing dinghy. Actually I guess it’s like this now, right ringing. Danny and I picked up the phone and I called him. I called him and it was his cell number, which means it got answered because cell numbers are on there because of two factor authentication. It’s on there, so people don’t hack your account. Well, what do you answer more your office phone or your cell phone that’s on you. Twenty four slash seven. 365. Pretty simple. So those are the three reasons why linkedin matters. Gene. Gene Hammett: Well, I appreciate you going through that because I think a lot of people don’t give it the credit that it’s due in inside of a marketplace, especially if you’re doing B2B. and in fact, you know a lot of people, and I’m sure you’ve had this conversation, so I’m just gonna ask you for everyone else. If you’re in a business where you’re selling B2B, yes, you can do some facebook stuff and there’s probably some smart things you can do, but can you give us a little contrast there between the differences of have buyer intent within facebook versus linkedin? Phil Gerbyshak: Sure. So first when I think about facebook, I think everybody who’s ever marketed, everybody who’s ever marketed as a tester and a retest her meaning they look at an ad, they say, Ooh, that’s a good ad. I wonder where that goes. Click, oh, I wonder what their funnel sequences click. Oh, I’m going to sign up for their newsletter. Click. Oh, I’m going to check out their white paper click and I did this to you a man last week. Phil Gerbyshak: I signed up for your newsletter. I’m checking this out. I want to see how’s gene marketing? What’s going on here? Right? So that’s facebook. I seen this ad. Oh, interesting. Okay, well I’m just a tire kicker. In fact, I’m worse than a tire kicker. I’m a money waster. Sorry Gene, I cost you at eighty cents, right? I mean Julie though. But that’s the thing. It’s like calling your competitors on their 800 number. It costs money and sadly some marketers do that just because they don’t have any creative ideas of their own. So they funnel hack you. Okay. That’s a whole sport for some marketers. Funnel hacking. Okay, so linkedin, on the other hand, if you’ve got to really be looking for it so that advertisement is so dead on, it’s got to be so dead on and nobody’s clicking it because linkedin is for work. People do business on Linkedin, they expect, again, remember I said Microsoft, not cat pictures, right? Phil Gerbyshak: The big difference there, so again, it’s Microsoft. It’s a behemoth, so we’re talking software companies, HR companies, we’re talking tech stack, we’re talking big machinery, we’re talking big purchase. People don’t spend thirty cents a day on an ad on linkedin. It’s eight to 12 bucks an ad on linkedin and facebook gets cheaper, but they’re garbage leads. That’s the thing. They’re not leads, they’re suspects. So if you’re a B2B and you have a real thing to market that has high ticket value, you need to be marketing on linkedin and yeah, spend five, 10 bucks on facebook, absolutely do some retargeting, do some remarketing, you know, absolutely, but the damage you can do in a good way on Linkedin is incredible and get this. You can do that just by up-leveling and going to sales navigator for 80 bucks a month if you use it wisely, right? Phil Gerbyshak: Again, you need a strategy. You need to know what you’re selling and you need to understand the tech. It’s really important. You need a digital selling strategy if you have one sales navigators freaking bananas, great. 80 bucks a month. Oh my gosh, if I could get 200 targeted leads a month off of 80 bucks. Gene, is that a good deal or is that a bad deal? Gene Hammett: You do a pretty good deal and I want to ask you because you know, you throw it out there. What is that a what could you tell us about getting 200 quality leads per month? Phil Gerbyshak: Yeah. Well, so yeah. So first, if you know how to use sales navigator, the way to do this as you set up your list, make it only 200 to 500 people that you know want the same insight. Ask them a question, maybe ask for their opinion about something. Maybe you’ve got a survey that’s set up. Maybe you’ve got an article that set up and you can send them a message. Second time they ignored you. Okay? The first time they ignored you, the second time you target them. And again, Hey Gene, just checking the CEO. Things are now. Sometimes people accept your connection request the first time. That’s pretty cool, or you have to spend an inmail, so one of the two, but linkedin sales navigator lets you also connect with open link people, which is some people they just want to connect. If you see the little circular logo by them and there are second degree and you have navigator, you can send them a no cost. Basically. It’s an inmail. We’re not connected but it doesn’t cost anything. So that’s an open link message. So between openlink and Inmail, you’ve got about 200 people in this $500 group, a 500 person grouping that you can target with messages. Phil Gerbyshak: I typically recommend coming up with a three to five message cadence that you might talk to people on. First one a really just asking a question. Second one, maybe going a little deeper into that question. Maybe an idea that you might have a third one could be to an ungated ebook or video. Fourth one from there. Could be, you know, trying to just get them on the phone because you’ve added some value and asking them a question not selling them. And the fifth one really, you kinda unload everything you’ve got and try to just basically swallowed them up with value because if you’re a valuable person, not a loud person, but if it five times you connect and it’s added value, added value, added value, added value added value five times. Most people are like, dude, you gave me all of that. I wasn’t gonna say anything Gene. Gene Hammett: You know when you’re talking about this, and he hung out with the question because I think it’s for a lot of people get wrong. What are your. What are your guidelines for using that question as an opener for a contact that you don’t know yet? Phil Gerbyshak: and then shut up and let them talk and so that’s an open and then don’t try to sell, try to earn some trust. Great. So if that’s a problem for you, do you know anybody that’s working on that problem? It doesn’t have to be this the answer because the goal is to make a little promise and keep a little promise and to make a little bigger promise and to keep a little bigger promise and then to make a little bigger promise to keep a little bigger promise so that they trust me enough so that when I do finally say, you know, I work with sales organizations, sales people and speakers as well as small business owners to help them build their business digitally. Is that something that you’re struggling with? And they say yes, and would you help me with that? Because I’ve added so much value and I’ve been so interested in me now they trust me enough to be vulnerable and say, Yup, you know what, I do struggle with that. Gene Hammett: That’s a pretty good point there. Let’s go ahead and dive into this because I think a lot of people get this wrong. And in my circles it’s, it’s kind of a joke. Like I got another one of those random connection request and the very next message coming in to me is either eight paragraphs or asking me to sign up for something or watch my hour long webinar or something similar like I already know, based on your way, you’re shaking your head, don’t do these things, but can you like, do you have a name for that? Phil Gerbyshak: Waste of time junk. I’m ineffective. Useless. Um, so the thing is 10 years ago when information was scarce, those things were when, when there was five to 10 vendors on the planet that do what you do when there was frankly zero competition, except for inertia of doing nothing and information. When I couldn’t Google every stinkin question I have that I need an answer to. Yeah, you’re right. That word now we fast forward. I’ve got too much information. Business owners that are in business now have too much information. My goodness. Why would you puke? More information at them? Try to, instead of adding information, add insight. Here’s how to use the information. So Gene, this number three reason. Let’s pretend that one of the top reasons because it is that people leave their company is not because of the work or the pay. It’s because of their boss. Have we seen this before? Is this something that’s impacted your company? Do you have a story you can share with me and maybe you know, I’ve got a podcast so maybe I can bring you on my show. We can talk about some things like that. Oh, you want to hear my story? Phil Gerbyshak: You want me to share my insights? Most of the time people just tell me stuff. Seldom. They asked me stuff and then actually care about the answer. Usually it’s just a setup, the knocking down insomnia product or service. I think that’s where people if we really either given site or get insight, we stand a much better chance of succeeding. Gene Hammett: They’re one of the things that I read from you is the power of just being genuine and not trying to be a salesman or trying to be a marketer, and I say this all the time. You reach out to companies that you’re. You have a genuine interest in not one that you’re faking and I know I’m not reading you wrong, but where does that come from, Phil? Phil Gerbyshak: I think it probably comes from my grandmother. My grandma on my mom’s side cared about everybody in the family and everybody around her. She lived in. She lived in a little itty bitty 340 square foot one bedroom apartment in Crivitz, Wisconsin where I’m from, and grandma would always have coffee and usually some ice cream for anybody that came by and would let them tell her story. Her their story, right? They should ask them their story. So grandma was genuinely interested in people. Now there are some people she would not let in her apartment because she wasn’t interested in them. She didn’t have time for them, she was, you know, she had eight children, probably 25 or 30 grandkids, many great-grandchildren, extended family. She came from a 12 or 14 brothers and sisters, depending on, you know, over time. Unfortunately, she was born very early in the 19 hundreds. So there were, you know, brothers and sisters that died along the way. Lots and lots of family. But grandpa was the glue that held our family together because she cared about those that she cared about. Phil Gerbyshak: And I didn’t realize this until later on those that she didn’t, she did not have time for. So she did not talk to everybody. She didn’t, even in the family, she did not talk to everybody. So she was very discerning, which meant, you know, I learned that early on, that no reason to fake that we like an uncle, you know, blood head because he’s a drunk and an idiot. But you know, an aunt Jemima here, she’s good, right? So in between where you have to discern, right? One obviously good one, obviously not good and we had to discern in there. So grandma taught me that and you know, I think I’ve kind of taken it to another level because I connect to even more people than my grandmother ever would. I mean she came from styles junction, Wisconsin, like population 190. So that was her entire world and I guess probably 12 or 15 percent of that that at least have that little town was my family. So, uh, you know, that came from grandma. Gene Hammett: Well I, I wanted to ask you that because it just, it, it comes through in everything you do feel. So I wanted to figure out where it came from. One of the things you’re best at is helping speakers with their own brand and sales and marketing strategies behind that. Um, what’s something you would tell other speakers because I think there’s a lot of people listening in here that are the face of their brand. They are the leader of their company. They know a lot of my clients are speaking at big events. Um, how would you use linkedin to actually get more speaking gigs? Phil Gerbyshak: Well, first demonstrating value instead of turning up the volume. Right? I talked about this a little bit before, but what do I mean by that? I mean do video and makes sure that it’s captioned. Make sure that you put the texts out there so people can read it and watch it because most video on linkedin is watched with the sound off. Okay, so that’s the first thing. And make sure that you’ve got some energy and those videos, right? Bring your juice. Now that doesn’t mean that you take 68 takes until it’s perfect either. So that’s about, you know, being unvarnished, being good enough just the way you are. So hold the camera up and talk to the camera like you’re talking to your friend g and that’s how I look at it, man. I look at that camera lens like I’m talking to you just talking to my buddy John, and here’s the advice I’d give Gene. Not, oh my gosh. I’m talking to 550 million people. I don’t know what to say. No, this is advice that I have for Gene. Phil Gerbyshak: This is it. Boom. Talk to the camera. Ninety seconds, maybe two minutes. That’s a big one. Turn up the value before you turn up the volume so people when they do find you that they really get you. I’d also say you don’t make your profile. We talked about this before. Make your profile or resource instead of a resume. I’ve got a little handout Gene that I’d love to offer your folks if they just go to LinkedIn profile report card.com. Get a free little 10 point handout of the 10 things that you can do to make your profile better because most people’s profiles sock and that’s being generous, so make your profile better. That’s the second thing. Add value first. Make your profile better. Second, and then the third one gets the heck off your profile and start having conversations with people that you want to have conversations with and stop expecting they’re going to find you, so get off your profile. Gene Hammett: fantastic. Well, I love these insights because a lot of them are even new to me and I’ve been a season LinkedIn user. Uh, I, I didn’t tell this to you failed before this, but I, I did a sales job. I’m in between my first company falling apart after nine years and becoming a coach where I was doing 70 to 80 cold calls a day and LinkedIn was the core tool that we use to research, provide a relevant kind of conversation and I lived in there for 11 months. Um, and uh, so I knew a lot about LinkedIn is what I’m saying, and a lot of this stuff is new, so I really asked if you’re listening in here and you’re looking for a new strategy that you want to consider how LinkedIn could be used in your business and really if you’re B2b, you really want to pay attention to how to engage smartly and position yourself as that resource and not just a, someone who’s trying to sell something. So thanks for being here. Phil. Uh, you already mentioned where they could get in touch with you, but I’ll let you do it again. Um, where can the audience follow up with you and make sure they see what you’re doing next? Phil Gerbyshak: Sure. Well, really the easiest way is just connected to me on LinkedIn. It’s pretty simple. If you can spell Gerba shack, you can find me at [inaudible], G E R B Y S H A K. now, if you don’t know how to search in Linkedin, just go to google, put in Gerbyshak, and guess what? Linkedin will be the third or fourth thing that comes up. Surprise, surprise. Feel free to send me a connection request. Tell me that you heard me on Gene podcast, let me know. And if you want that free download, it’s real simple. Linkedin profile report card, not calm, it’s totally simple, right? And then you know, you’ll get that, you’ll download that. And then I provide my insights. Some videos. I’m totally relaunching it in September of 2018. So whenever you listen to this, that’s later than that, that’s cool. Then you’re going to be like, Oh wow, great. Phil Gerbyshak: It’s just coming every week and if it’s before that and all you get is the report card, just know that I’m ramping up and repositioning that to add even more value because I’ve found that, you know, just sending crappy newsletters doesn’t get anything done. I’ve made all the mistakes too, right? Like, I’m sharing the good stuff today, but there’s plenty of mistakes I’ve made. We could talk for the next two weeks, gene, man, but hopefully this stuff that I shared, some good stuff that actually helps people. Gene Hammett: Absolutely. I love it. And, uh, the mark of a professional as someone who’s willing to admit they made mistakes and, and I’m sure that’s what has gotten you to what actually is working. So, uh, thanks for being here at leaders in the trenches and sharing your wisdom. Phil Gerbyshak: My pleasure. Thank you, Gene. Gene Hammett: Fantastic interview with Phil. I love this. It’s a little bit granular for most of my interviews, but it felt like I needed to understand LinkedIn and a better degree in it. And I know other companies and leaders want this too. They want to figure out how they can get their teams to engage in a thoughtful way representing the company so that they can sell and market and position their company to get more business. So all of the things we talked about today can help you. And if you want to follow up with Linkedin, make sure you check out fills information. It is really going to change your world. All right, that’s my piece today for this. Hopefully, you’re enjoying these kinds of interviews. You enjoy what we’re doing out in the marketplace. If you are seeing any of our ads or any of our things in the social channels, make sure you like a comment, comment, heart, whatever it takes. As always, lead with courage and I’ll see you next time.